A Tender Heart » Blog Archive » An Unexpected First! 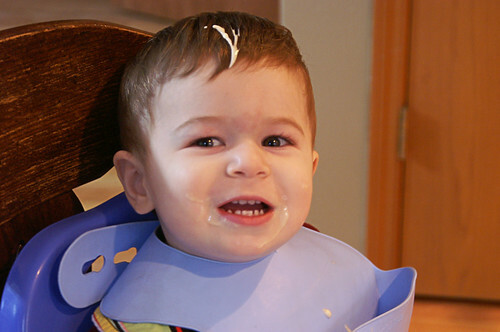 With an adorable dollop of yogurt running down his hair! I didn’t see how it got there, but I thought it was a perfect way for him to celebrate the morning of his 21st month birthday. You see, this little guy is a very clean, conscientious eater. And if anything ever gets on his hands, face or tray, he typically tries to wipe it off or requests for help to wipe it off. 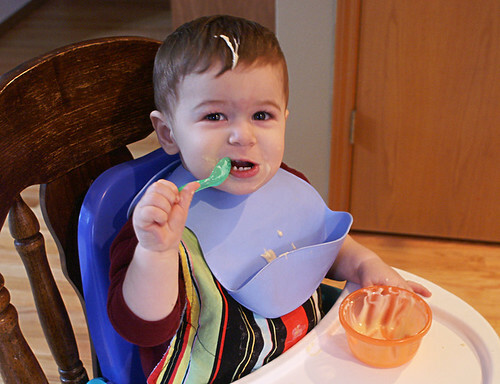 So, up until this particular morning, he had never gotten any food in his hair his whole self-feeding life. And even though he has no idea it’s even there and it’s not likely to happen again, I think it’s darn right cute to see! Thats pretty funny. Elora was the same way, she always wanted us to wash her hands after she got one drop of food on them. Josh on the other hand, will make a HUGE mess, THEN ask to have his hands washed. And its usually on the back of his head, and the backs of his arms above his elbows. 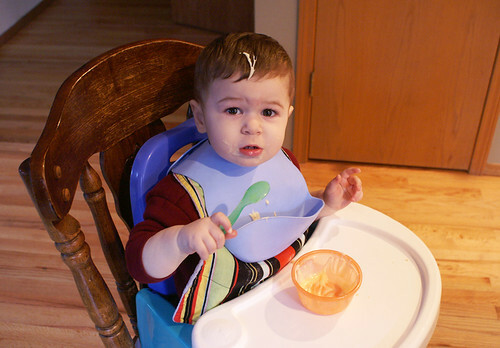 I’m sure Bubbers accidently tried to scratch his head with his spoon hand and did not know what he had done. He definitely could have gotten his “neatness” from his mother, (I remember).